Learn How to Play the Guitar Today! Starting out any music style isn’t easy. Not only do you have to learn new techniques, but you have to take the time to familiarize yourself with the genre itself; the sounds, the fallbacks, everything. Luckily, there is always one place that you can start when learning a new music style; scales. All music is based off of scales. All music styles are based off of similar scales. Bluegrass guitar is no exception. In this article, we will discuss the most commonly used bluegrass guitar scales. The most commonly used scales in bluegrass music are the pentatonic scales. These scales tend to have an Asian sounds due to the intervals that they involve. You may recognize the pentatonic scales, if you’ve ever played piano, as the scale that uses all of the black keys on the keyboard. Unlike most scales, the pentatonic scales consist of only five notes, which means that they lack two of the notes that make up their brother scales. The notes are the submediant and the leading tone. The most used of the pentatonic scales is the G Major pentatonic scale. The G Major pentatonic scale consists of the notes G, A, B, D, and E. As we mentioned before, the G Major pentatonic scale is similar to the C Major scale save for the fact that it excludes the submediant and the leading tone of the scale. Another of the most common major pentatonic scales is the C Major pentatonic scale. This scale consists of the notes C, D, E, G, and A. Just like the G Major pentatonic, it excludes the subdominant and the leading tone of its brother scale to achieve its respective properties. Now that you know a few major pentatonic scales, and how to form the remainder of the scales. Unlike the major pentatonic scale, the minor pentatonic has a subdominant and leading tone. The intervals that are excluded from the minor pentatonic are the supertonic and the submediant. This gives a different style to the minor pentatonic, setting it apart from the major. If the excluded intervals were the same for both the major pentatonic and the minor pentatonic scales, the scales would all consist of the same notes. The most used of the minor pentatonic scales is the A minor pentatonic scales. It consists of the notes A, C, D, E, and G. As mentioned above, the supertonic and the submediant are excluded from the scale. Now that you know the most common bluegrass guitar scales, the next step is to familiarize yourself with them. 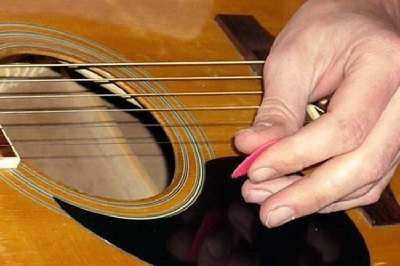 Try making some licks using crosspicking, or playing the scales as flatpicked scales. Have fun, and good luck!